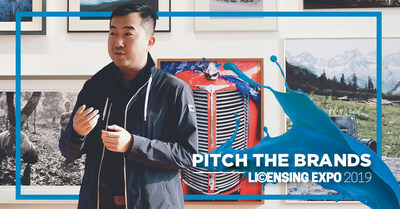 Pitch the Brands gives inventors the opportunity to present their product to consumer product experts during Licensing Week 2019. PITTSBURGH, March 19, 2019 /PRNewswire/ -- InventHelp, a leading invention services company, and Licensing Expo, the world's largest licensing industry event, have announced their collaboration, Pitch the Brands, to take place during Licensing Week 2019. During Pitch the Brands, inventors can present their product to an executive panel of consumer product experts and have the opportunity to win an InventHelp services package totaling $18,000. To learn more and apply for Pitch the Brands, click here. Steve Scebelo, Vice President, Licensing and Business Development at NFL Players Inc.
"Throughout the past 35 years in the invention industry, InventHelp has learned that inventors both desire and need feedback from consumer product companies. This essential feedback can help them determine how to improve upon and move forward with their invention ideas," said InventHelp President Robert Susa. "Partnering with Licensing Expo for Pitch the Brands will allow driven, deserving inventors to pick the brains of some of the industry's most brilliant minds. It is a once-in-a-lifetime opportunity." Licensing Expo is accepting submissions on their website through April 15, 2019. By April 29, InventHelp will choose ten finalists to present a demonstrable product in front of a live panel and audience at Licensing Expo 2019. The winner will receive an exclusive package, including: industry submission, 3D CAD drawings, prototype modeling, inclusion in InventHelp's VIBE, publicity services, and more. "Products are a cornerstone of the brand licensing industry. Innovations in design, production and distribution help keep our industry growing year over year," said Jessica Blue, Senior Vice President of the Global Licensing Group, UBM. "We're thrilled to give entrepreneurs a platform to showcase their product on the biggest stage in brand licensing. These new ideas help shape the industry through unique products and selection." For more information on Pitch the Brands, see below. To register for the Licensing Expo for free, please click here. InventHelp has been helping inventors submit their invention ideas to companies for 35 years. The Pittsburgh, Pennsylvania-based invention services company has more than 65 sales offices throughout the United States. They offers inventors services which could include prototyping, 3D design, and patent referrals. Launched in 1980, Licensing Expo is the world's largest and most influential annual trade show dedicated to licensing and brand extension. The show floor is merchandised into two zones: Characters and Entertainment and Brands, Agents and Design. More than 16,000 retailers, licensees, manufacturers, distributors and licensing agents attend the Expo from more than 67 countries. Licensing Expo is organized by UBM plc. UBM is the largest pure-play B2B events organizer in the world. Our 3,750+ people, based in more than 20 countries, serve more than 50 different sectors. Our deep knowledge and passion for these sectors allow us to create valuable experiences which enable our customers to succeed. Please visit www.ubm.com for the latest news and information about UBM.